Reflect back on the last time you witnessed unfamiliar children interacting with one another, they march right up and fearlessly say hello don’t they? Kids expect other kids to be kind and accepting up until the age they enter school, before this time they aren’t wounded or conditioned by adult belief patterns acquired at home or on a mean spirited playground. They don’t feel separate and they naturally carry a sense of belonging. On the contrary, we adults pack decades of history and hurt in the bags we drag behind us daily. Years of disappointment, internalized pain and heartbreak manifest an outer shell of protection that keeps us feeling separate from the world. But if we’re honest, even though rejection is a pain most of us still carry, sadly it’s our expectation of rejection and our subsequent action toward others that continues to water the prickly plant of separation we long to bury. It’s when we have the courage to lay down our “history” and walk forward expecting something different that we experience the world as fresh and inviting. Others react on a primal level to our internal belief patterns because whether or not we like to admit it, we wear our wounding like clothing. We might not see that reflection when we look in the mirror, but others do. When we drop our old stories of pain, we let go of how it’s always been and open ourselves up to the possibility of something new; but sadly most of us unknowingly continue to paint the box we live in each morning as we greet the new day. When we stumble into the bathroom and see our reflection in the mirror, we have two choices: we can either begin the day believing our same old thoughts while practicing our same old habits, or we can remember that we’re looking the internal artist who creates our life experience in the eye and simply suggest something new. What we carry out the door is reflected back to us on the grand mirror of the world. When we face the world with an expectation of being accepted, we change the reflection others see. My top suggestion? Fake it until you make it. Just like donning a new pair of shoes and checking them out in the mirror, when we let a different internal belief shine out onto the world (whether we believe it fully or not), the world reflects what it sees back to us. 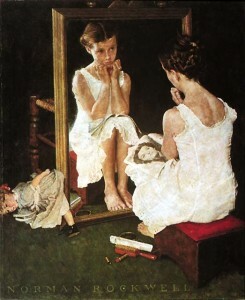 Photo: Norman Rockwell found on Wikipedia.